Alventis is a Universal Information Manager that can record all your valuable data: free-form rich text notes, contacts, tasks, inventory, budget, employee records, resumes, sales leads, real estate records, personal collections, and so on. The number of table formats and data-entry forms is unlimited. Full-text indexing ensures that your searches are lightning-fast. 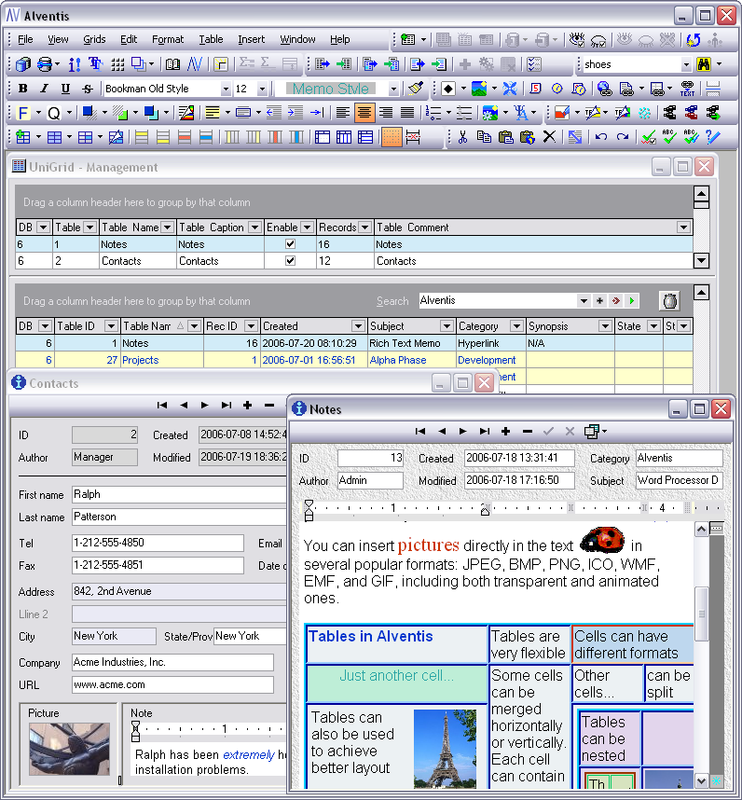 Banded reports are created with drag-and-drop ease. The Professional Edition gives you the ability to create your own tables from scratch or modify existing ones. Create as many data-entry forms as you like quickly and easily - all without writing a single line of code! The Enterprise Edition brings you the advantages of a robust client/server architecture, secure multi-user operation, and easy deployment. Infinitely more than a PIM, Alventis offers you features only found in industrial-strength DBMS solutions - for a fraction of the cost. Visit www.alventis.com for more information! Michel Chichkov, Alventis Corporation: Alventis is using TDBRichViewEdit quite extensively and probably in some new and advanced ways, so it may serve as a nice showcase of your terrific components. Some unusual things we do are: we don't use RVActions, so our GUI is very different and more streamlined; we have a (possibly unique) MemoSearch feature (see our online manual topic ihfx_memosearch.htm); our Reports use RV very extensively, including non-modal print preview and quasi-WYSIWYG mode (ihfx_reports.htm); find in memo works somewhat differently from normal and it works across item boundaries (ihfx_find_and_replace.htm). There's probably more, but this is what I can think of right now."